MOSCOW, January 14. /TASS/. /TASS/. 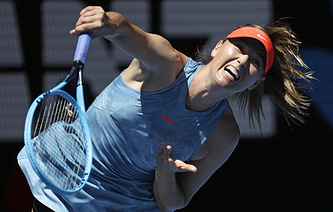 Russian tennis player Maria Sharapova said 1st round match of the 2019 Australian Open was a good test for her shoulder, which was previously injured and forced her to retire last September for the rest of the season. In the opening round on Monday of this year’s first Grand Slam tennis tournament, Sharapova served the so-called ‘double bagel’ on Harriet Dart breezing past her British opponent with straight sets win of 6-0; 6-0 in 63 minutes. "I think it was a good test for my leg, for my shoulder," the official website of the Women’s Tennis Association (WTA) quoted Sharapova as saying at her post-match news conference. "Obviously the shoulder hasn't been much of a secret in the past year. That's been something I have been struggling with why I had to shut down the season after the US Open [in September 2018]." Sharapova also started this season with a withdrawal. On January 3 she retired from the quarterfinals round of the WTA tournament in China’s Shenzhen citing an injury. She left the competition during her encounter with Aryna Sabalenka of Belarus. The Russian player was trailing behind her opponent 1-6, 2-4, when an injury forced her to retire. "I'm still not where I want it to be, still working through some painful days. But, you know, I felt like I did all the right things today in order to get through that match," Sharapova said commenting on Monday’s match against Dart, who debuted this year at the Australian Open series' main draw after battling through the qualifiers. The Russian tennis player is seeded 30 at this tournament, which boasts $44.5 million in prize money up for grabs and runs from January 14 to 27. She praised her 1st round opponent saying Dart was out on the court completely ready to win the match. "When you're playing the first round of a Grand Slam, and I have been in many positions, like last year at Wimbledon, I came out against a qualifier that played really well," Sharapova said. "There is no doubt that my level wasn't where I wanted it to be, but she [Dart] was there to take the match." Summing up results of her play and win in the 1st round, Sharapova said: "I still really have the passion for this." "I enjoy seeing the effort that I'm able to put in, and I think that hard work will always ultimately come to the surface, in tennis or something else. But I do feel that it's really shaped the way that my career has been in and my life has been." "If I put an effort into a certain category, sometimes it doesn't come overnight, doesn't come in a year, and sometimes it comes in something else in your life, and I believe in that," the Russian stated. Sharapova is now set to clash in the 2nd round with Sweden’s Rebecca Peterson. The 23-year-old Swedish player also sailed past the opening round of the 2019 Australian Open with the straight sets win, defeating on Monday Sorana Cirstea of Romania 6-4, 6-1. "I still have to play another match, and so does she. My coach is Swedish. I don't know if that will maybe help me a little bit more," she told journalists. In 2018 Sharapova participated in 11 tennis tournaments, including four Grand Slam competitions. Her best results last season were the semifinals of the tournaments in China’s Shenzhen and Italy’s Rome. Playing at the Grand Slam tournaments last year Sharapova reached the third round of the Australian Open, the quarterfinals of the Roland-Garros in France, was knocked out in the opening round at the Wimbledon and reached the fourth round stage of the US Open.